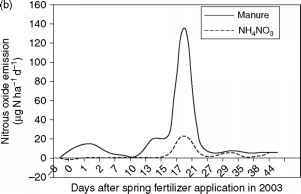 Figure 2 The influence of mineral N fertilizer, manure, and rainfall on the emissions of N2O from intensively managed grassland. Measurements were made using static chambers (Figure 1) before and at intervals after fertilizer application. The differences in the shape and magnitude of the N2O peaks can be explained by differences in rainfall pattern. (a) In 2002, rainfall distribution before, during, and after fertilizer application ensured optimal conditions for N2O emission. 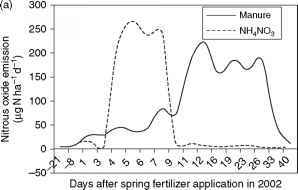 (b) In 2003, fertilizer was applied during a 3 week dry period, and rainfall only started 10 days after fertilizer application. The much broader peaks associated with the manure treatment is a result of the organic carbon source supplied in manure, stimulating denitrification. Modified from Jones SK, Rees RM, Skiba UM, and Ball BC (2007) Influence of organic and mineral N fertilizer on N2O fluxes from a temperate grassland Agriculture, Ecosystems and Environment 121(1-2): 74-83.
reactions stop at N2O whereas at high WFPS (>70%) denitrification to N2 may dominate, provided the C and N supplies are not limiting.